Tested with Warn and Smittybilt winches up to 16,500 lbs. Whether you're blazing a trail through the back country or just rolling through town Go Rhino BR10 front bumpers offer you the increased protection, aggressive style, and functionality you've been looking for. Go Rhino BR10 replacement bumpers are made out of 3/16 inch steel that is coated by a durable textured black powder-coat finish. These heavy duty bumpers give you standard features like intergraded D-rings, 16,500 pound winch mount that has been tested with Warn and Smittybilt. 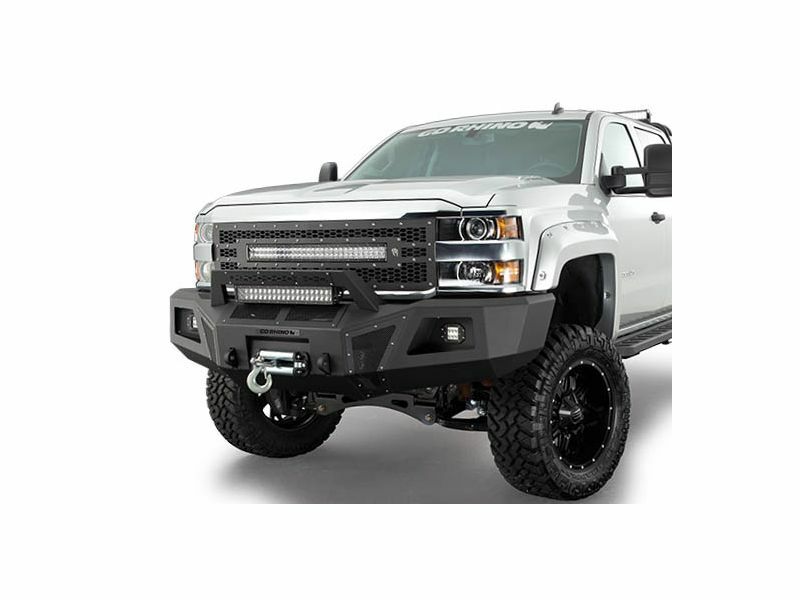 There are so many great optional features for BR10 front bumpers like the flush mount kit for Rigid D-Series lights and the auxiliary light mount that can hold up to a 20 inch light bar. Go Rhino makes installing the BR10 front bumper easier than most heavy duty bumpers because they make the winch tray separate from the rest of the bumper. That means that you and a buddy can install the BR10 replacement bumper right at your own house without special tools. Protection, functionality, and style, what more could you ask for in a bumper? Go Rhino front bumpers offer everything you need, and everything your truck deserves. The Go Rhino BR10 front bumper can be installed fairly easily at home without any drilling or cutting. These replacement bumpers bolt right up to the frame of your truck, however I would recommend that you have a buddy help you install do to the weight of this bumper. If you have any other concerns or questions please give us a call.